By far the yummiest philanthropy, Pi Phi Pizookies was held at the Chapter house this year on October 19th from eight to midnight! For those of you who are not familiar with the beauty of what is called a pizookie - it is a warm cookie that is slightly underbaked with ice cream on top! Friends and family got to eat endless pizookies for just five dollars. We needed all hands on deck to pull off this philanthropy, so girls were pre-making pizookie cookies all day long to prepare! We ended up making over 1,000 pizookes and raising $3,613 to donate to our philanthropy, Read>Lead>Achieve, which promotes childhood literacy initiatives across the nation. It has been such an amazing experience working with the chapter to plan these philanthropy events and I can’t wait to see what next year’s VP of Philanthropy, Emma Samson will plan! Click the link below to watch footage from our philanthropy to see how fun and successful the event truly was! With the incredible work of our Vice President of Philanthropy, Emma Samson, the support of all of our CA Theta members, and the efforts of the entire Greek community, our chapter raised over $15,000 for our philanthropy Read>Lead>Achieve. Although Arrowjam was at the end of the quarter, its preparation began long before then for both Pi Beta Phi and all of the fraternities and sororities involved. For the 19th year in a row, the greek community came together to support Read Lead Achieve through a fun, spirited dance competition that concluded after a week of coin wars, t-shirt sales, and other smaller fundraisers. Many of our sisters had the pleasure of coaching either a fraternity or sorority throughout the quarter, and three amazing and talented sisters took on the task of choreographing and teaching Pi Beta Phi’s own dance. Pi Phi Parlor is our new spring philanthropy. The community is invited to come to the Pi Phi house to enjoy icecream sundaes, rootbeer floats and more, for one sweet and sticky afternoon. For an additional dollar, ticket buyers can purchase a whipped cream filled pie tin and pi any pi phi (or fellow attendee) in the face! 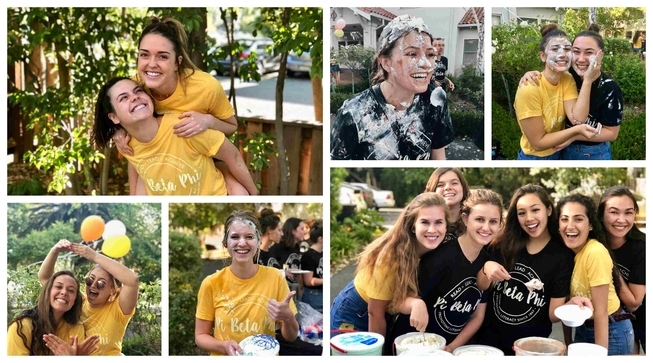 By the end of the event, bellies were full, Pi Phis were sticky with whipped cream and more than $2000 had been raised for Read > Lead > Achieve. This new fundraisng event could not have gone better and we could not be more thankful to our incredible Vice President of Communications, Emma Samson, for all the work she put in to organize the event. Some of our members had the honor of participating in this year’s national celebration of Pi Beta Phi’s Fraternity Day of Service in Bakersfield, California. Four of our members made the long drive down to participate in an all day book drive for Bakersfield elementary school teachers and students. Over 20,000 books were donated to area schools, after-school programs and community programs serving students from low-income families. Similar to the weekly volunteering our members do through Reading Room, where children are read to by our members, the sisters of Pi Beta Phi spent Dr. Seuss day with the children at Glenwood Elementary School on Friday, March 2nd, as a tribute to Read Across America Day and Dr. Seuss’ birthday. “My favorite thing about day was all of the questions all of the kids had for me. They asked what my favorite book was, asked why I specifically chose Green Eggs and Ham to read to them and then told me all about their favorite books! They were all just so curious and interested. 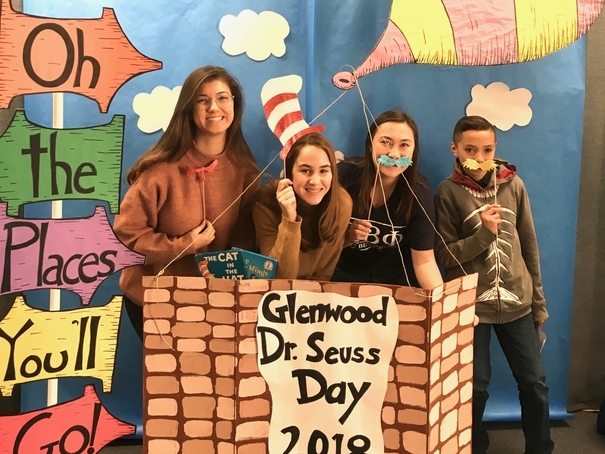 After I read another Dr. Seuss book, one of them said, ‘Did you notice all the pages rhymed in that book?’ which I thought was really cute!” said Jaycee, our Assistant Vice President of Philanthropy who helped organize such a special event.